SEO is a technique of increasing the ranking of the pages in the search engine. The process is usually legitimate and organic, but there are also certain illegal ways of doing it. These techniques that violate the norms and conditions of search engine result page or SERP is called the black hat SEO. If the website is caught resorting to these techniques, it can be totally banned from the search engine results which most certainly end up harming your business. Hence it is always better to avoid it no matter what results it promises. Talk to your SEO consultant Singapore and be very particular about the techniques that are to be used for your website. Adding unrelated keywords: SEO is all about optimizing the page with relevant keywords that will bring you in the first page of the search results. If you add irrelevant keywords in order to get more hits, it is an illegal tactic. Keyword stuffing: You should not stuff your web page with keywords. It should make sense and not read like gibberish. Do not repeat the keywords indiscriminately. Do not put hidden texts or links: Adding small or hidden texts or links at the bottom or in the same color is illegal and your website can be banned for that. Cloaking the pages: You should deceive your visitors by giving one set of description and keywords in the description or search engines and putting different content altogether in the actual web page. You should always be honest with the visitors and not trick them into visiting your site. Gateway pages: Don’t create pages that is stuffed with keywords in an indiscriminate way and when the visitors go to the page they are redirected somewhere else. Duplicate content: Copying the content of another site to your site in chunks is illegal and is a sort of plagiarism. You can however quote certain parts or cite the example of the website. Spam blogs: Also known as splogs, these blogs are not created for informational purpose, but just for directing the visitors to their site. The pages in question are stuffed with just ads that the visitors will be forced to click. Put relevant and fresh content in your blog for the reader’s perusal. Social networking spam: Targeting people and messaging them with links to your site is a strict no-no. Cookie stuffing: Placing cookies stealthily in one computer and forcing the user to visit your site is totally illegal. Always avoid all kinds of shady and Black Hat techniques to get your required number of hits. Always opt for the service provided by the best SEO company in Australia who can give you good results in an organic way. Optimization process takes time. Therefore, you have to be patient. It will not get good ranking in just one day, it will climb the rank slowly, but steadily. It sure is tempting to find a way or method in which one can rank his or her site at the top extremely quickly. The surge of traffic that you get will eventually land your site in big trouble. Many people have ruined their online businesses by simply ignoring what their SEO service providers are doing. You must always be in check as to what is happening with your website so that it does not disappear from Google indefinitely. People please understand that Black hat SEO never pays off. It is easier to simply follow the rules and regulations and harder to cheat. Google and other major search engines are constantly working on new updates on their algorithms so that the “honest” webmasters have their sites at the top instead of the ones that cheat to the top. You need to have lots of patience when it comes to SEO as nothing comes easy when you want to rise to the top. There are lots of ways in which Black hat SEO companies try to trick search engines to reach the top but such a victory is always short-lived. 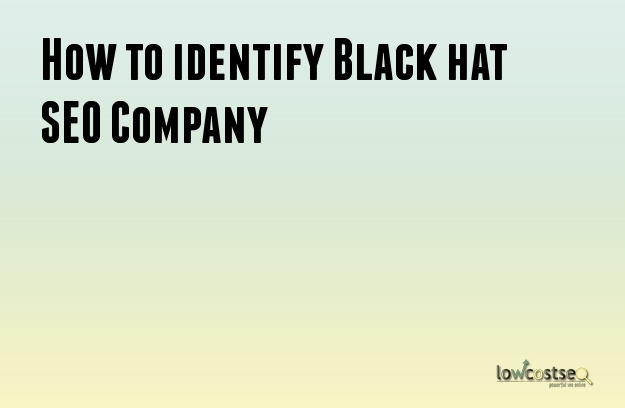 So the question is, how can you identify Black hat SEO methods? And how to avoid them? Firstly, be wary about those SEO companies that make “to good to be true promises”. If they tell you to buy paid links to boost your site to the top, this sure is a red alert sign. We have seen many sites online selling paid links and many people ignorantly purchasing those links and thereby falling in this pit. There are no shortcuts at all in SEO so work with those companies who offer manually created links not paid ones. Have a look at the reputation of the company that you want to hire. Go through their own site and see if its ranking on Google, read their customer testimonials or ask them for references from real clients that you can talk to. If an SEO company has no presence at all on Google then that is sign too of Google blacklisting them. Another way is when you see a website whose navigation process is not transparent, they have hidden text on the pages in an attempt to keyword stuff. This is purely Black hat SEO. The most important thing one can do as a webmaster/website owner is to check your reports (traffic). Black hat SEO is simply the use of excessive number of high PR backlinks from non-relevant sites. SEO takes time and requires lots of patience so if any company promises immediate results then get alerted. SEO takes time and any good SEO company will tell you this right away. Also have a look at their own site's quality, if it is of poor quality then it will surely raise concerns to you as you can understand the difference between good and poor quality. The SEO industry is a very competitive industry where there are lots of Black marketers offering all sorts of services and promising you page one rankings. No one can guarantee to get your site to page one and if someone claims to have close ties with Google then that’s a lie too. Stay away from such SEO companies. Watch out for those companies that provide PR9 links for a very low price, this is a scam. It does not seem logically right for PR9 sites to simply link to any other sites. Please stay away from these or risk loosing your money. Finally stay away from companies that demand full upfront payment , they are just trying to trick their way into your wallet. Well, there are several ways to avoid being tricked by a Black hat SEO company. First and foremost is to educate yourself on the basics of SEO. Once you understand the concept of SEO, then you can ask all sorts of questions while looking for an SEO Company. This way you’ll know if the company is using fair methods or not. You have spent a lot in getting your website ready so do not neglect on the most important part of marketing now. If you have the budget, you can hire a SEO consultant/expert to assess a company for you and their methods used. All in all, Black hat SEO will get your site banned, de-indexed or penalized to a lower rank on the search engines. The choice is entirely yours! SEO is very commonly used in order to get the better ranking in the search engines like Google, Yahoo and Bing. Google often updates its algorithms hence it is an imperative that the SEO techniques are also redone on a regular basis. There are many organic techniques that one can use for getting good ranking. There are also several unethical or ‘black hat techniques’ that should be avoided at all costs. These techniques are not only illegal, but they can also harm the ranking of the web site on the search engines. Google can severely penalize your site if you use these illegal tactics. · Cloaking: This is a technique where the search engines are deceived by showing a different content that what it is actually happens to be. For example, the web code that you have used tells Google that you are directing the visitors to a games site, whereas the site is actually an ecommerce site. This is a kind of deceiving and actions can be taken against you for misleading the users. Google has some algorithms that they use for detecting these illegal practices. · Link Exchanges: This is a harmful practice that can lower the ranking of the web site significantly. Before Google had come up with algorithms for detecting this, Link exchanges were popular and were practiced by many. You may think that this helps you get a lot of links at a less amount of time, but his is not especially helpful for securing ranking on the search engines. Low quality links can lower the credibility of your web site to a large extent. · Duplicate Content: This is considered to be the worst method of SEO black hat technique. Google always looks for original content and ranks only fresh and unique content. If you copy the texts from other sites, you efforts to get the good ranking will totally go to waste. Google only ranks the original content and if you copy it will not rank your site. It is better to run your content through the detectors like Copyscape to ensure that the content is original and not copied from any other site. · Keyword Stuffing: Keywords play a major part in all SEO efforts. Placing the right keyword in the right place is the trick to getting the ranking that you want. But, that does not mean that you go overboard with it. If you stuff the content with the keywords or clutter it Google will read it as spam. You should follow the keyword specifications and use it in the correct density. · Hidden Text: It may sound strange, but many people use hidden texts to increase their SEO ranking in Google. This basically implies text written in white ink on a white background or black ink in black background with extra keywords included in it. They are not readily visible to the eye. If this is caught by Google, you will be penalized.